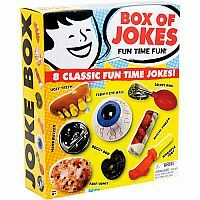 Chock full of silliness, the Box of Jokes is a classic collection of hilarious and timeless practical jokes. Includes 8 goofy gags, such as the hand buzzer, ugly teeth, whoopee toot and fake vomit. Just add a little mischief and let the pranks begin! Ages 6 to 10 years. Measures approximately: 6.50 x 7.75 x 2.25 inches..